Part of a graphic (seen below) explaining the transition a student takes from freshman to post-graduate career, and how Webster plays a role in that process. 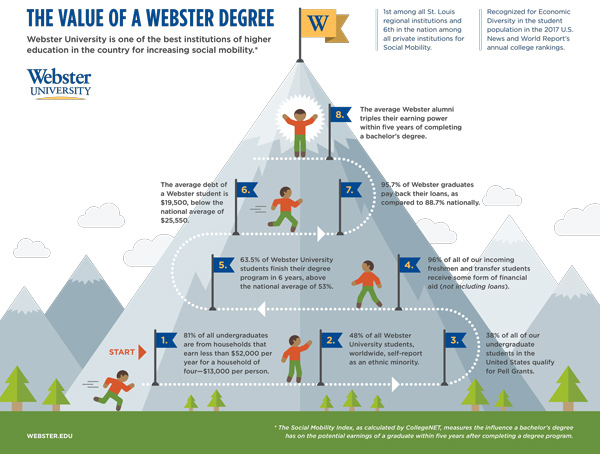 ST. LOUIS – A new study affirms that Webster University excels in offering accessible and affordable bachelor’s degrees for students from households that earn less than the average national income. Importantly, the study concludes that Webster graduates typically increase their earning potential by securing employment that increases their income level from precollegiate levels. In fact, the University is one of the best in the country for increasing social mobility for these students. 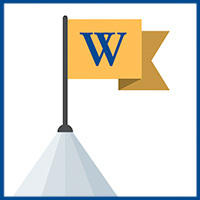 Webster University was named the top school for “Social Mobility” in the St. Louis region and the sixth best school among all private non-profit universities in the United States, CollegeNET announced this month with the release of the third annual Social Mobility Index (SMI). The SMI is a measurement of the average graduate’s earning potential within five years after college as compared to students with similar backgrounds who do not attend college. One of two Missouri institutions highly ranked. In other words, on average, most colleges accept students from affluent households and once they graduate, the average graduate will earn an early income that is comparable to their family’s average household income. There is less social mobility as a result, the SMI study concludes. Click for a full-resolution PDF of the stats above. The study says that more than 81 percent of students at Webster are from households that earned less than the national average of $52,000 per year for a family of four, and that 38 percent of students qualify for Pell Grants. The study also showed that the average Webster graduate was earning $39,800 per year within five years after completing a bachelor’s degree. (Click the image for a PDF of the graphic). Last year, Webster University was recognized by U.S. News and World Report for “economic diversity,” a ranking that recognizes institutions with high percentages of undergraduate students receiving Pell Grants. The most recent data about Webster University shows that more than 39 percent of undergraduate students receive Pell Grants. Other factors that gave Webster a high score include its 63.5 percent graduation rate, a student loan default rate of 4.3 percent (below the national average of 11.3 percent) and an endowment of nearly $131 million. The SMI is computed from five variables: published tuition, percent of student body whose families are below the U.S. median income, graduation rate, reported median salary 0-5 years after graduation, and endowment to calculate the net impact an education at a specific institution would have on earnings early in a career. Data are collected from IPEDS (Federal Department of Education data) and other third party sources like Payscale, Inc. which annually surveys people in the workforce for experience and salary. The study included only alumni who have earned a bachelor’s degree but have not earned a master’s degree. The full CollegeNET SMI can be found at http://www.socialmobilityindex.org. The CollegeNET press release about the study can be found at http://finance.yahoo.com/news/collegenet-2016-social-mobility-index-110000231.html.